The wedding tent was up. The makings for the wedding feast were procured. The guests had begun to arrive. Hamid and friends gathered together to plan. It was decided that when Gulnisa went to fill water at the community tap, they would drive by and kidnap her. They acted on their plan. With her back turned, Gulnisa was an easy target. Gulnisa was brought kicking and screaming to Hamid’s home. His mother and aunts surrounded her. “I have a boyfriend,” she screamed. “But Hamid loves you truly, madly, deeply,” they said as they forced her to wear the wedding veil. Background: Ala kachuu is a form of bride kidnapping practised in Kyrgyzstan. Supposedly suppressed when the country was under the Soviet Union, it has now been revived and is widely practised. While some of the kidnapping is consensual i.e. the boy and girl are courting already, many a time it is non-consensual and the girl’s family has no choice but to agree to the marriage post the kidnapping of their daughter. While this is illegal in the country, the government and the law enforcers turn a blind eye to this as it is culturally acceptable. However, Kyrgyzstan is not the only country where this is prevalent – other countries in Central Asia and some African countries too have this practise. Remember when I started #100Words here and then moved it to Write Tribe? I love the 100 word format and it’s been too long since I used it. Now I plan to do a #100WordsonSaturday on the 4th Saturday of every month. Today I’m responding to Julia Skinner’s 100WCGU (100 Words Challenge for Grown Ups). Her prompt is ‘Truly, madly, deeply….’ in honour of the late Alan Rickman. Click the badge below to join in. Yeeeek, thats barbaric.. Good post, Corinne, Interesting… and a very good reminder. We should never take our rights as women for granted…. Barbaric, indeed, Eli. Women have to suffer so much indignity all the world over. I have shared this post – what a horrible thing that, years after I studied some of these practices in my cultural anthropology classes in college, they are more popular than ever. Are we going backwards? This is one reason why I enjoy reading blogs from all over the world. We must educate! anchayats” in some ways, this one! Goodness Corinne! What a dreadful tale and the fact that it is still going on is awful. I’m glad the prompt allowed you to share this information. How scary is that! We still live in barbaric times. Never knew about this. Good one Corinne. 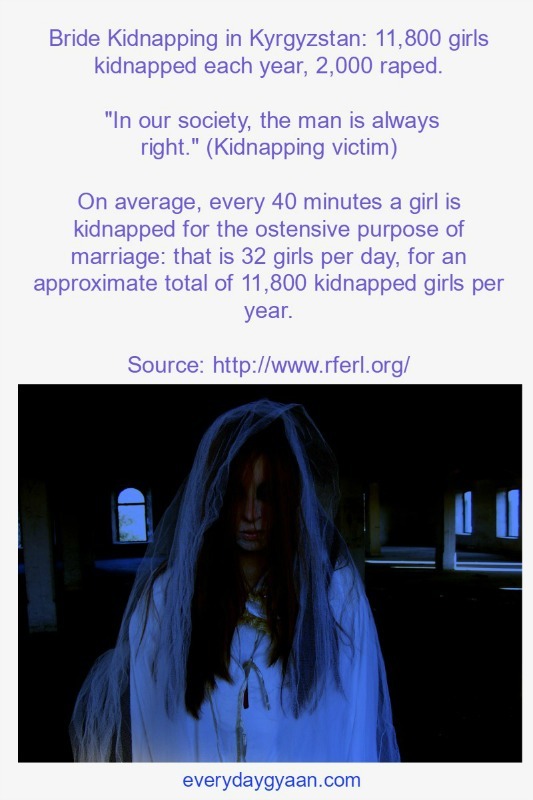 Bride kidnapping ….. so scary. Lucky that it was happening in India. A great awareness post, Corinne. Wow, this is horrific. It especially strikes home for me as my daughter, son-in-law and eldest two grandchildren lived for years in neighbouring Kazekhstan. Thanks for making us aware of this.